-HTML5 applications which are able to run in smart phones, tablets and PCs with modern browsers. -Microsoft Wondows Server runs SQL Server, PLC PC clients, OPC-UA clients, reporting server. 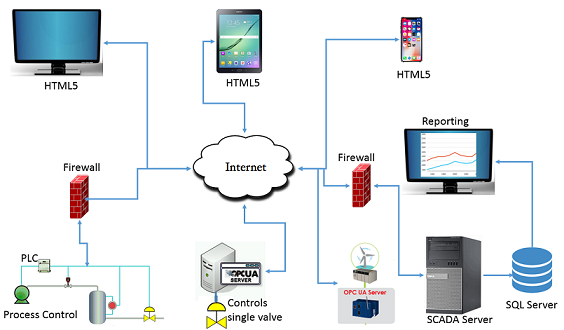 -PLC or embedded PC that runs structured program which can control different equipment or collect data and pass to SCADA server for the users. Data can be processed for generating reports. -Different kind of actuators, sensors, remote I/O or RTUs which actually does the work in the fields. -OPC-UA server controls a machine or a unit as independently. When OPC-UA clients ask or pass a command then UA-Server execute the command to the unit which is controlled by OPC-UA Server. OPC-UA Server can generates events for clients, generates historical data access. UA modeler tool is used to design the OPC-UA Sever. HTM5 enabled web browser can edit, manipulate, execute command and see reporting. This site provides mainly tutorial for engineers who want to develop their skills in automation/mobile software area. We provide details tutorial and sample application that can be used as starting point for automation software project.